We are pleased to announce the launch of the 2019 pilot projects funding call. The deadline for applications is 15 February 2019. The Internet of Food Things Network Plus was set up by EPSRC to stimulate and coordinate inter-disciplinary research into the digital transformation of the food production and supply chain through the application of new technologies such as IoT, AI, smart packaging, blockchain, new business models, and other forms of innovation. A key instrument in achieving this is our pilot projects funding calls. The application form is available on the website: Application Form. However, please ready the guidance notes carefully first. Individual projects can request up to £40,000 total funding (total spend up to £50,000 as per FEC 80% funding). cyber/physical security and other aspects of resilience. Successful projects starting by 1st May subject to contracts. Completion should be by 1st November. Please contact the IoFT Network+ administrator (jduarte@lincoln.ac.uk) with any queries. This entry was posted in Uncategorized on January 3, 2019 by Steve Brewer. Is the British food industry experiencing a gastronomic youthquake? Food and (non-alcoholic) drink is the new rock n roll for the millennial generation who prefer to stay in than go out and, when they do venture outdoors, it’s to eat. Of 18 to 34 year-olds, 57% eat out regularly compared to 21% who go out clubbing. Food is the number one way millennials socialise with their friends, says Josephine Hansom from insights company Youthsite. What also marks out this generation – other than veganism, Instagramming and unicorn-themed food – is innovation. Whether it’s meat-substitute burgers that bleed, broccoli coffee or food delivery startups that will bring in-vogue Korean food to your picnic in the park, millennials are at home with technology. Josephine Hansom was speaking at the Internet of Food Things Network Plus (IoFT) launch event in London, which gathered experts from industry, government and academia to kick off a three-year investigation into how artificial intelligence, data analytics and emerging technologies can improve the safety, security and efficiency of the UK food supply chain. From fridges that trigger online grocery orders when the milk runs low to using the blockchain to ensure the traceability of beef, digital technology offers unprecedented opportunities to address today’s food challenges. It could not be more timely. From Brexit to cyber security, the modern food manufacturing supply chain has never been more vulnerable in terms of the complexity, demand and uncertainty surrounding processes, sources and dependencies. Nor has the industry ever been more critical to the wealth of the nation. As IoFT’s network lead Professor Simon Pearson outlined at the event, food manufacturing is the UK’s biggest manufacturing sector. With a value of £108bn it is bigger than the aerospace and motor industries combined, providing 3.9 million jobs and £20bn of exports. What’s more, it is a stable business – the simple human need to eat cannot be disrupted – and one of the main drivers of the economy. It also has a massive societal impact. There’s the issue of food waste, with 10 million tonnes of food thrown in the bin every week, and the environmental impact of 17% of UK CO2 being produced by the food chain. On an individual level there are more than a million cases of food poisoning a year in the UK while obesity costs the NHS £47bn a year. How can digital technology help? There is exciting work taking place with emerging technologies – industry 4.0, the Internet of Things, artificial intelligence, blockchain, cyber and machine learning. What is currently missing is how all that work joins together through trust, standards, governance, digital business models and shared data (and whether that’s open or closed data). The more connectivity there is of all these systems, the more value will be added. 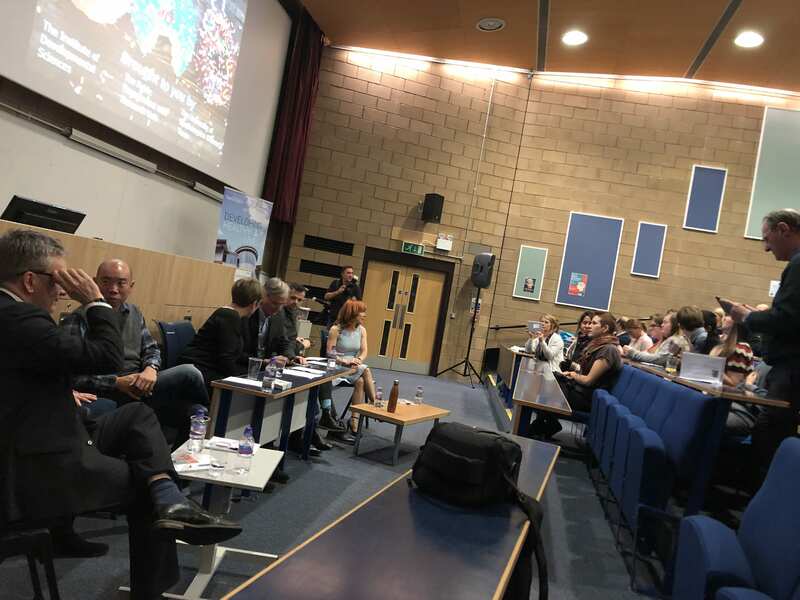 The event’s speakers brought a range of perspectives to bear on the topic. 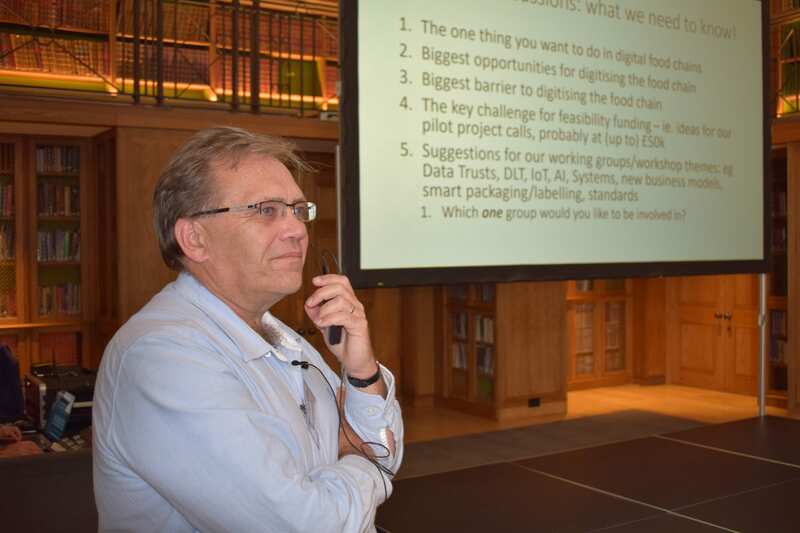 Professor Guy Poppy, chief scientific adviser at the Food Standards Agency (FSA) invited the community to help the FSA address the challenge of modernising regulation during these transformational times of huge horizontal and vertical changes to the food supply chain. The FSA has been ‘open by default’ since January 2016 and maintains around 70% of all its data assets as open data, with its food hygiene rating scheme the most accessed dataset. With food, the availability of data can have a life or death impact but data has no value until it is accessed and used in some way. For example, with more people admitted to hospital because of allergies and intolerance than food poisoning, the FSA now offers an allergy alerts data service, powered by application programming interfaces (APIs), to get information about food recalls really quickly to businesses and consumers, such as via the charity Anaphylaxis UK, potentially saving lives. The FSA has also successfully completed a pilot using blockchain technology in a cattle slaughterhouse. It’s the first time blockchain has been used as a regulatory tool to ensure compliance in the food sector. Blockchain was a topic picked up by Kirsten Coppoolse of Amsterdam’s The Fork, which offers blockchain training and monthly meetups for a community of 1400 people to discuss use cases, such as ‘blockchain coffee’ and how Albert Heijn, the Netherlands’ largest supermarket chain, is using blockchain to track orange juice. Patrick Curry of the British Business Federation Authority also highlighted the potential of blockchain and pointed to the government’s food-related blockchain working groups – red meat, fruit and veg, food data policy management authority – involving numerous organisations exploring the issues from a starting point of collaboration, coordination and commitment. Collaboration was also a byword for Keith Thornhill, Sieman’s head of food and beverage for UK and Ireland. He was keen to highlight the role of technology in increasing productivity, whether by using IoT to improve operational equipment efficiency or by increasing automation of labour – such as in picking and packing – to deal with the dwindling labour force for this kind of work post-Brexit. For the new IoFT and its coordinators, the task now is to distil the many potential ideas, set priorities ready for a call for projects in January… and meet the challenge of turning the gastronomic youthquake into a gastronomic techquake. This entry was posted in Event, Network on September 25, 2018 by Steve Brewer.